Sunday, after a relatively low-key weekend, I decided, kind of off the cuff, to go into London for the day. There was nothing I really went in for — other than some Christmas shopping — but I figured I’d wing it. I had planned to shop a bit at the big Waterstones bookstore right off Trafalgar Square, but unfortunately, they didn’t open until noon. Having some time to kill, I wandered down the Strand. The skating rink at Somerset House was packed, so I ducked into the courtyard for a couple of photos. I noticed on the way out that the Courtauld Gallery inside the Somerset House complex was open. Intrigued, having never visited before, I went in to take a look. As a student, I got in free, which is always a bonus. If you haven’t been able to tell before now, I’m something of an art enthusiast. I’ve never taken a formal art class — either history or practice — but I’ve been to several of the major galleries of Europe and developed a taste for viewing pieces. Italian Renaissance art and French Impressionism are my two favorite categories. The Courtauld Gallery is comparatively small, but I was impressed with its pieces. The Gothic religious art, namely several triptychs and polyptychs, and its collection of Peter Paul Rubens paintings are excellent. The Impressionist collection, particularly a few Renoir works, was also awesome to see. A Botticelli painting depicting Christ being lowered from the crucifix featured a portrayal of Mary Magdalene I don’t think I’ve ever seen in a painting, with her hair loose around her in typical Botticelli waves. 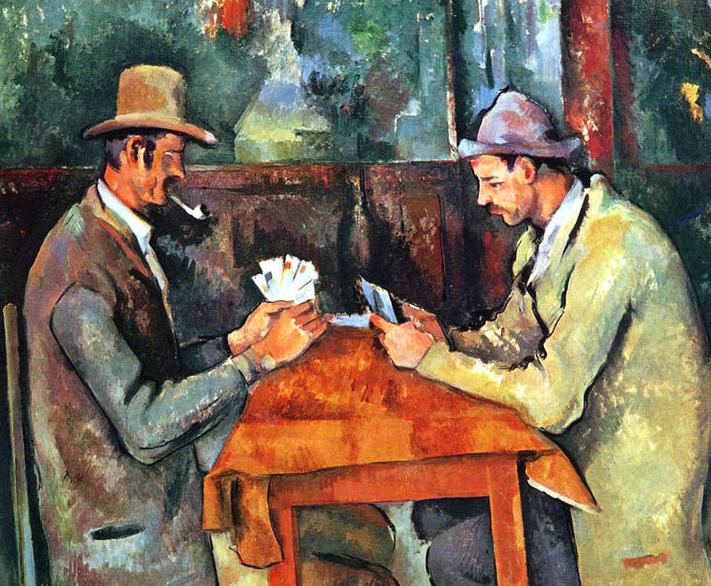 The real experience at the gallery, though, was the fabulous short-term exhibit on Paul Cézanne’s “The Cardplayers.” Cézanne is one of those painters whose style is so defined, you can immediately identify his work. I’m a fan of his still-lifes in particular. “The Cardplayers” is a series of paintings depicting French rural peasants playing cards (obviously). The exhibit showed Cézanne’s process, including pencil “cartoons” (early sketches) of the figures and other portraits he had done of the subjects. At the time, his treatment of the peasant class was somewhat cutting-edge, especially given that he often depicted them in more genteel settings, such as his studio or a country house. After I finished there, I walked (it was nice!) to the Tate Modern. 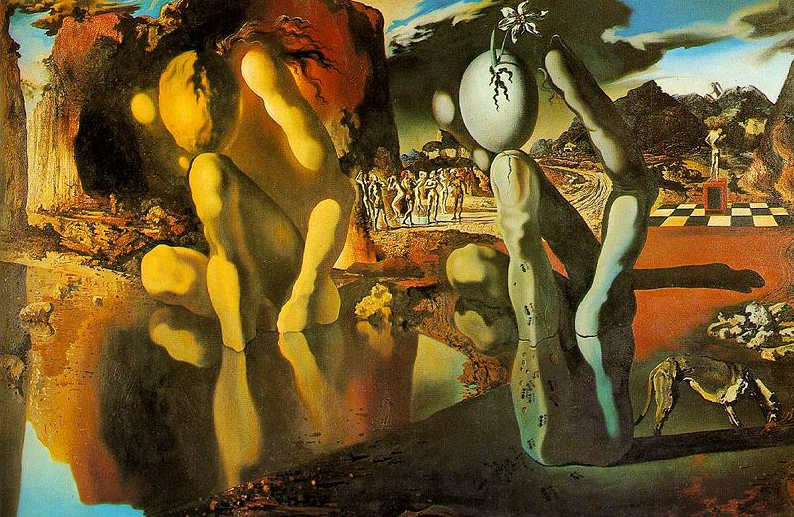 I’m not normally enthusiastic about post-Impressionist work, but I had yet to see Salvadore Dali’s “Metamorphosis of Narcissus” and the Andy Warhol exhibit. After a quick espresso in the cafe, I headed upstairs to view the Dali painting. The painting has one of the most clever visual tricks I’ve seen. On the one hand, you can see the kneeled figure of Narcissus, who in Greek mythology fell in love with his own reflection in a pool and drowned. The gods turned him into the narcissus flower. On the other side, you see a hand gripping a cracked egg, from which emerges a narcissus flower. Though the two figures are different, they are, in terms of shape, mirrors of each other. Salvadore Dali's "Metamorphosis of Narcissus"
I next visited the Warhol exhibit, a room plastered with gauche cow-print wallpaper that Warhol concocted after a friend told him that “no one does pastoral work anymore.” A self-portrait is there, as well as a camouflage installation, a stark black and yellow painting of a dollar sign, and a visceral (tinted with red, like blood) painting of two guns, done after the artist was shot by an admirer. I spent the rest of the day roaming the city, going across the Millennium Bridge, having lunch at Chipotle (where else), getting a gingerbread cupcake at the Hummingbird (of which I’m now the mayor on Foursquare), walking through St. James’s Park and through Westminster and Whitehall (luckily the student protests have died down), browsing books at Waterstones and going down to the Imperial War Museum to view its Holocaust and crimes against humanity exhibits, in preparation for my human rights class next term. Another great day in the city.